Here’s a quick step by step guide to get your YouTube video ad campaign started. First click here and you’ll be directed to the YouTube advertising homepage. Click the ‘Start advertising with YouTube’ button, follow the instructions below and you’ll be advertising on YouTube in no time. 2. You’ll need to put in some ad copy and choose a thumbnail. Your ad copy should highlight any promotions or offers your running, launch of a new product or a short and snappy line differentiating your product from others. 3. Choosing your budget is next, it’s quite reasonable at €7.27/$10.00 per day. 4. Choose your audience. This YouTube keyword tool will give you suggestions https://www.youtube.com/keyword_tool. If you opt into having your video shown on the Google display network, your commercial will appear on websites that are relevant to your target audience. 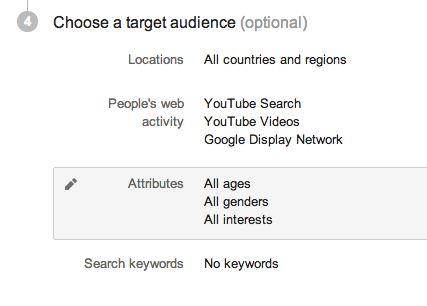 With this in mind, it’s advisable to target your audience by interests so your CPC is kept low. After that you’ll be redirected to your AdWords account to fill in billing details and review your plan and you’re ready to go!